Disclosure: I received this product for free as part of a review for Zin180. The opinions in my review are honest and my own. As some of you know, I have been trying to find some ways to de-stress. Not only am I stressed with the holidays, but work being more stressful than usual. With me putting in so many hours, I need some way that I can unwind and relax. One of my husband's suggestions was trying meditation. When I think of mediation, I think of Buddhist monks sitting in a temple, not busy women like me. With him talking about how it used to help him, however, I decided to do some research, where I ran into the Zen180 Meditation Program. Wanting to know more, I reached out to the company, who was happy to provide me a copy of their program for review. Zen180 is an innovative, new meditation program that not only teaches you about meditation, but helps you make it a part of your life. Through their easy to follow modules, you learn to make meditating a habit, allowing you to exercise your mind and relax yourself. Below, I included a video by the programs founder that does a great job explaining the program and its goals! As someone who had never practiced meditation, I had no clue what I was getting into. From my previous reading, I knew that mediation was great at stimulating and relaxing the mind – something I desperately needed. From the moment I got into the program, I was impressed. The whole focus is not really teaching you meditation, but making it a habit in easy to follow modules. 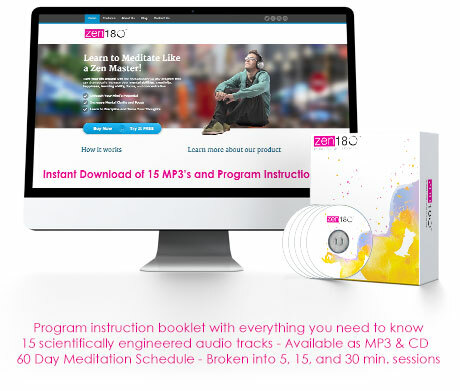 What I really loved about the program is how it is broken into modules based on the amount of time you have available, letting you meditate for 5, 15, or even 30 minutes. For busy people like me, the 5 to 15 minute sessions seemed like a lifesaver! While I haven't explored all the program yet, the one I enjoy the most so far is the Relaxing Mind (Delta) program, since it seems fantastic at helping me reduce stress. While I'm obviously not finished with the 60 program, I can easily see this becoming part of my daily life. Being someone who had never meditated a day in her life, I have to say that the Zen180 Meditation Program is amazing for beginners. It is easy to follow and in a format that allows you to meditate anywhere on the go – even during lunch breaks out in your car! The program also made me want to learn more about meditation, something that made my husband quite happy. Based on my own experience, I am happy to give Zen180 Meditation Program an A rating! Want to try Zen180 Meditation Program for yourself? You can currently purchase this innovative program on the Zen180 website. To learn more about this amazing meditation program, make sure to check out their website, and reach out to Zen180 through Facebook or Twitter! Disclosure: Budget Earth did not receive compensation for this review but did receive free product for review purposes via Tomoson.com. All opinions on this product are my own and may differ from our readers' opinions. Would you like to have your products featured in a similar giveaway event? Want to increase your social media exposure before the holiday season? See how we can help! Contact budgetearth@gmail.com to see what we can do for your company! I have been wanting to learn to meditate also. I bought a book with CD but I didn't seem to connect with it. This sounds like an interesting option. I will have to learn more about it. I love meditating. It really makes a difference in my days. Thanks for the review. I can attest that meditation is a great stress-reliever. I also find it great for dealing with pain, including back pain and headaches. This program looks very good – I'll have to check it out more. I try to meditation, but I'm so stressed that it got the best of me. But Meditation is so healthy, physically and mentally. People should do this all the time. Maybe people would be more less stressed. Thank you for the Review.! Relaxation would be awesome for me. I suffer from PTSD and major depression, and epilepsy. I'm going to look into this. Medatation really does work. It takes a while to find the perfect setting where you won't be disturbed. I definitely need a way to destress myself. This sounds easy and fun enough to try. I will be trying this and letting you know how it works for me. Thanks for another awesome review. I hate the word meditation – so freakin hard to keep autocorrect from saying medication or mediation… ridiculous… but, that aside, I really love meditating and the calm peacefulness I feel when I’m doing it regularly… I’ve not been doing it for a year or so and I can definitely see how not meditating negatively affects so many aspects of my life. hope you stick with it and find it beneficial. this sounds awesome, i love meditation! yoga is good! thanks for sharing! I'm completely on board with this. When my eleven year old daughter was dying, she used a form of meditation to help get her through many difficult procedures. She always said she "went to the beach". She'd meditate while holding her special purple velvet wrapped seashells. "The whole focus is not really teaching you meditation, but making it a habit in easy to follow modules." The problem is I need someone to teach me how to meditate, I don't think I am doing it right. I used to go to a Buddhist temples but I always felt I was missing something. I was actually thinking of starting to meditate routinely lol I sometimes do yoga and that helps me relax a lot. I def would not mind trying this at all. This sounds great. I have been wanting to get into meditation because I have really bad anxiety and my doctor thinks this might help with my panic attacks. I've downloaded some meditations from itunes but I just can't get into it. This might be more my speed as it's visual. Thanks for the review! I really wonder if this would help me. My stress level is so high, I can barely sleep, think, or rest. I've never tried meditating, because I'm always so busy, I would probably end up stressing about what I'm NOT doing while I'm meditating!! Need to try this. perfect stress reliver. Perfect timing now during the holidays. Need this. Thanks for sharing. need to try this perfect stress reliver .perfect timing now during the holidays . need this so bad thanks for sharing, hope heard someting please in time these is when i need help!! !